Meet the Clark County Sheriff Candidates (Video) | Audio and video stories from Southwest Washington. After 24 years, Sheriff Garry Lucas has decided to retire. His decision has arguably created one of this year’s most important political races in Clark County. 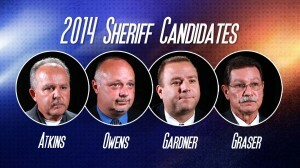 COUV.COM interviewed all candidates running for sheriff: Chuck Atkins, Shane Gardner, John Graser and Ed Owens. If we asked your friends and family, who would they say you are? How will you improve the Clark County Sheriff’s Office culture and moral, if needed? Theft, the most prolific crime in the Clark County, often leaves its victims feeling violated and unsafe. It also appears to have a low response priority. Why is that? What difficult decision or event has prepared you to lead the sheriff’s department? How would you differentiate yourself from your opponents? In the coming weeks we will be releasing additional video profiles of each candidate.